One Thanksgiving stands out to me more than any other. I don't remember the table settings, the food, or how old I was, but I do remember that my Bammieroo came to visit (Bammieroo is my Mother's Mother). Seeing Bammieroo was always a cause for celebration as she lived far away and we didn't get to enjoy her visits all too often. Of all the things I could potentially remember from that blessed day, this is what I remember: My sister Pammy and I sitting on either side of her pulling on her loose neck skin repeatedly clucking, "Gobble Gobble!" and calling her a "Turkey Lurkey!" I remember Pammy and I giggling uncontrollably and Bammieroo playing right along with us. If you took a midnight trip to Meridian, Idaho no matter what time you arrived whether it was 8 PM or 3 AM, Bammieroo would present a handful of pies at the door with excitement written all over her face, and then she would sit up with you eating pie, until all the recent events had been covered and rejoiced over. 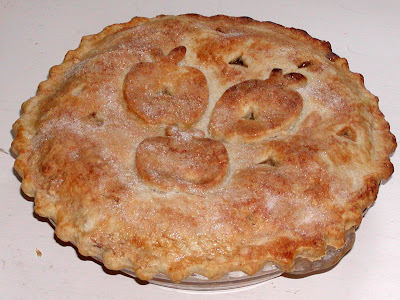 This Thanksgiving year I was commissioned to make a few pies, one of which was apple. I try and not get things too complicated when it comes to apple pie. Peel and core enough apples to fill your pie pan heaping full! My pie pans require 8-10 apples. I know that some people are particular about which apples to use, but I don't think it makes a difference. In fact, one woman from my ward came to me who had had a slice of my pie, and said, "That is the absolute best pie I have ever had! I've decided it must have been the apples you used - what apples did you use?" I grinned, "Just the cheapest ones I could find!" The secret is the caramel. 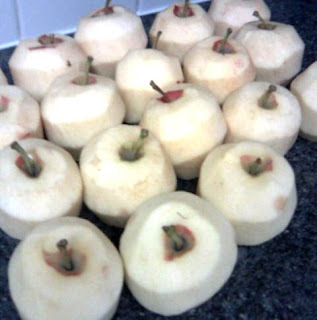 Slice apples one inch thick - I use my shredder/dicer/slicer attachment on my Bosch. Use a potato peeler, or salad shooter for your own convenience. My mom does it by hand and so more power to her! Place in a bowl and mix with 1 cup sugar, 1 cup flour and juice from half a lemon. I also add a dash of cloves, and a generous amount of cinnamon. Fill unbaked crust with half the apples. Pour Fahrenheit 350° Caramel Sweet Sauce over the apples to completely cover them. Fill your pie pan heaping with remaining apples and cover once again with Fahrenheit 350° Caramel Sweet Sauce. Cover pie with top crust, brush with whisked egg and sprinkled sugar, and bake at 350° until juice inside pie is bubbling hot! how darling! how funny that you did that to your gma! hilarious! what a cutie! greeting you with pies!? LOVE IT! and, wow that sounds divine!